What happens when tiny Death Jr. goes on a 2D rampage on the DS? When Backbone Entertainment initially made viewable their plans for a PSP title called Death Jr., the new IP seemed to have enough potential to pull forth the attention of a good many gamers. The surreal storyline of a tiny and cute grim reaper dealing with high school woes and a nasty sense of abandonment by his father, a not so tiny and cute grim reaper, was more than enough to garnish some appeal, and not to mention, the cover stories of a couple popular gaming magazines. A couple years later and hindsight offers us the chance to look back upon the release of Death Jr. with the knowledge that despite the games unique storyline and interesting setting, gameplay mechanics and camera issues doomed what was a potentially brilliant IP into mediocrity. Even the sequel to the game never quite proved itself as the savior of handheld 3D platforming, and that is where Death Jr. seemed to be heading, down the road of being another platforming attempt that just failed to capture audiences like the big hitters, namely Mario and even the PSP's own Daxter. However, Backbone refused to allow Death Jr. to slip softly into the night, and thanks in part to the success of Nintendo's handheld machine, they've decided to give Death Jr. a shot on a device that is a little more geared to the audience they were initially reaching towards. The new game is titled Death Jr. and the Science Fair of Doom, and while the setting is as quirky as it always was, Backbone has to have at least some desire to reel in the younger demographic of the DS. Whether this focus will hinder or help the gameplay is up in the air, but we can at least tell that some of the series' previous issues won't be the cause of any trouble. For the first time Death Jr. is mostly abandoning the open-ended 3D platforming worlds in favor of a slightly more classic 2D sidescrolling platformer setting. However, the game even exceeds that classification as well, relying significantly on occasional battle events that take place in a 3D action setting. This juxtaposition of two genres is making what Backbone hopes will be a fairly enjoyable and detailed game experience. Add on to the two gameplay styles an additional character, Pandora, Death Jr.'s classmate and adventure companion, and heavy touchscreen control, and The Science Fair of Doom quickly rises from the category of an IP hastily ported to a new and more popular device, to being perhaps the most fully-fledged realization of Death Jr. yet brought to life. The second playable character, Pandora, offers a different moveset than Death Jr., and while she may lack in fighting ability, switching off between her and Death Jr. will be necessary to solve some of the games puzzle elements. The other unique aspect of the game, the inclusion of mostly touchscreen control, is sure to be the most talked about feature within The Science Fair of Doom. Widely regarded as just as much curse as blessing, the touchscreen wasn't something Backbone chose, unlike many other developers, to ignore. Instead the game is to be played with movement mapped to the d-pad, jumping performed by the L button and attacking and all other activities relegated to stylus control. 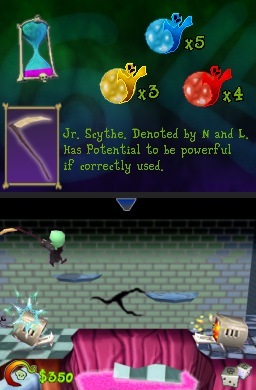 Tapping or stroking the stylus along enemies allows Death Jr. to initiate attacks and even combo strings. At the very best, this feature will be akin to attacking enemies in a setting similar to the DS game Contact or even a PC game like Diablo, although hopefully with a little more depth to the system. At the very worst, this feature is what will break the gameplay for many. Backbone is obviously treading upon dangerous ground by relying on a mechanic such as this one, so they chose to still allow a more classic control scheme to be employed in addition to the touchscreen. 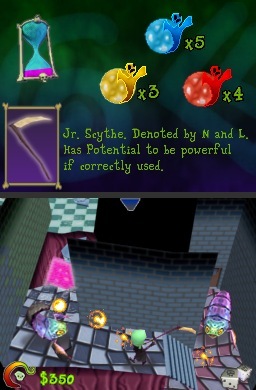 If nothing else, Death Jr. and the Science Fair of Doom should succeed in being one of the DS' most visually appealing entries, despite being not quite up to the standards of the PSP iterations of the series. The 2D segments of the game look more like the newly crafted 2.5D model of games like New Super Mario Brothers and Ultimate Ghosts N' Goblins. The world of Death Jr. is once again lush and vibrant, and contains a setting as uniquely stylistic as anything else the DS has within its catalog. Despite all of Death Jr.'s unique gameplay elements, wonderful art direction, and the strongly developed IP, the real test of this franchise will be launching amidst the unfortunate fervor of a relatively recent post-Pokemon Diamond and Pearl setting. Surely the DS' most anticipated game might bear down upon the sales and adoption of this fledgling franchise, but if Backbone has crafted a game as filled with quirky content and uniqueness as this release seems, only time will tell where Death Jr. finds his next home -- returning to the PSP, or once again striving for success on the DS?